When I told you I quit drinking alcohol I also mentioned giving up wheat, corn, and dairy again. And truly, the only hard one in that bunch seems to be dairy. More specifically half-and-half. Because despite the churning belly after every sip of cow dairy, despite the eczema, the thing that holds me back from quitting dairy every time is my morning cup of coffee with copious amount of organic half-and-half or skimmed raw cream. Try as I have to become a purist and drink my coffee properly like any other good coffee snob (black), I just can't make the leap. So usually when I'm off dairy I give up my morning cup as well and switch to black tea or nettle chai with homemade coconut-almond milk instead. But this time around I was convinced to find another way. 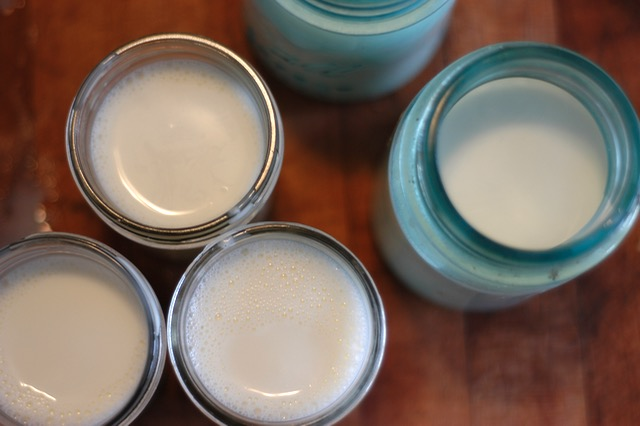 So I set to work modifying my coconut-almond milk recipe (creamy in its own right) to be more like half-and-half. No, it won't fool your grandma, but good gracious! If you're off dairy and grieving over your lame mug of watery almond milk-diluted coffee each morning while jealously eyeing your partner's cup, here you go. You're welcome. If you are struggling with digestive troubles or issues with bone and tooth health, pre-soaking your almonds is advisable. If you can't integrate another layer to your morning cup of coffee, skip this step. Seriously. Place almonds in a mason jar with 1 tsp of sea salt. Cover with water and soak overnight (or up to 24 hours) at room temperature. The next day, drain and rinse your almonds. The soaking water will be murky and gross. That's normal. Allow to rest for 10 to 15 minutes if you have not pre-soaked your almonds, or dive right in with the next step if you're short on time or pre-soaked the night before. Puree your mixture on high power for 3 to 4 minutes until it become a uniform frothy mix, free of the slightest chunks or lumps. Puree for another minute or two if you have it in you or if your blender is wimpy. Pour through a mesh strainer lined with a thin cotton towel or cotton bandana, then bring the corners together and squeeze and twist to extract as much liquid as possible. Compost solids or freeze or dehydrate for other uses (ideas here). Add a splash to your coffee and delight in the pleasures of a creamy cup of goodness. Mmmmm…… That's more like it! Store in a glass jar in the refrigerator for up to four days or until it becomes sour. Psst… I even saved the recipe for you as a PDF! I also cut the cord on half & half. It has helped me drink less coffee but when I do have coffee I go for the coconut oil/ghee combo. I love it!! Might have to try your recipe to see how it compares. Seems like more work than I am willing to put in. Also trying to take out the sweetener. The oil/ghee combo needs no sweetener. We also got a cold brew system and surprisingly that is creamier and doesn’t require a sweetener, and is the first time I could enjoy a black coffee. thanks, going to give this a shot. i too, gave up coffee when i went off of dairy because it just didn’t taste right with coconut creamer and regular almond milk is too thin. Oh thank you! ! If this is as good as you say, you may have just saved my mornings, which, sadly, can’t include half and half any more. I’m returning to America in just over a week, and this is the first thing I’m going to make! Thanks for addressing this niggling problem! I’m wondering, if a lazy-ish person took a box of store-bought almond milk and poured it into the blender with the unsweetened coconut flakes, could she come up with a similarly satisfying “cream”? I hope you enjoy it, Erin! Hi Loma! You could certainly give it a try, but I’m not sure if would save you much work, since you’d still have to strain the pulp. If you do it, let me know what you think of the result. I just made this and it is delicious. I’m going to try to make a turmeric latte with this milk. Thanks!